Harlos Productions and The Sydney Fringe present THE FOUR SEASONS by Arnold Wesker at the Newtown Theatre, Newtown. 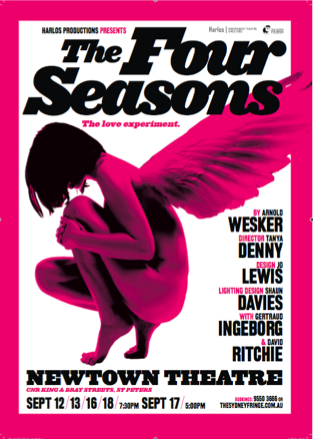 THE FOUR SEASONS by Arnold Wesker is “a classical portrayal of the seasons of love that hovers somewhere between poetry and ballet.” Written in the Sixties it is a departure from the socialist realist writing that had occupied Mr Wesker in this period. THE KITCHEN and THEIR VERY OWN AND GOLDEN CITY sit either side of this play. First performed in 1965 with the then young, Alan Bates and Diane Cilento, Mr Wesker felt that he needed to justify this ‘poem’ to personal love in an Epilogue to his published text: “ Deny plays such as this as a part of socialist literature and you alienate all men and women who need to know and be comforted by the knowledge that they are not alone in their private pain. You can urge mankind to no action by intimidating it with your eternal condemnation of its frailties. THE FOUR SEASONS was written because I believe the absence of love diminishes and distorts all action”. So, at 1.15pm on a beautiful Spring Sunday, how gorgeous to be outside (? ), I rushed to the theatre to sit in the dark and support the Sydney Fringe and the artists who have worked hard to contribute to our lives. How glad I was, that I did. With all of the new writing and/ or the directorial convolutions of some “old’ writing as well, it was a pleasure to sit in the dark and have the language of this formidable writer be expressed. Great ‘food’ in the diminished textual/language menu of late. It was not only a mild surprise but a balm, a gift to my aesthetic nervous system – the memory of good language and just plain theatrical intelligence wafted back. You don’t appreciate what has been absent until it appears again, sometimes eh? Mr Wesker deals with LOVE and the ‘love’ between a woman, Beatrice (Gertraud Ingeborg) and a man, Adam (David Ritchie) using the metaphor chapters of the seasons. Interestingly, Mr Wesker begins his work in the season of winter. Interestingly, Harlos Productions, then, has cast two performers, who if not yet in the winter of their journeys are in late autumn. First written with “two young people” entering a deserted house, we find two older people already on stage . Curiously the maturity of these two performers added resonance to the poetry/prose of Mr Wesker and his observations. Both of them handled the text lovingly with great ‘ownership’ and integrity and gave more than a pleasant experience to those of us present. The Director, Tanya Denny has edited the script down, dramatically (This showing lasted maybe only 45- 50 minutes), but there was still a sense of cohesion and flow. Certainly the density of the ‘ingredients’ that we were given was rich enough to sustain and inspire one to find the text and read it all. There is sensitivity and care demonstrable in the work of Ms Denny. It is modestly but thoughtfully designed by Jo Lewis. In a season of mostly new work and young, ‘new’ artists in the Sydney Fringe it was a gift to have the wealth of experience in both writer and actor, giving inspiration to what the path of practice can give. Ms Ingeborg and Mr Ritchie are tireless artists, who seemingly motivated from the necessity to perform, are perennially active in finding a way to do so and give Sydney-siders ( including, especially young people, through their school productions), a possibility to experience a range of otherwise undiscovered works. This is a mark of appreciation for these two modest but committed artists. It is wonderful to see two ‘older’ artists still in the lists and not deserting the field to the ‘young’ alone. Many Thanks. Many thanks to The Sydney Fringe as well for the breadth of inclusion.